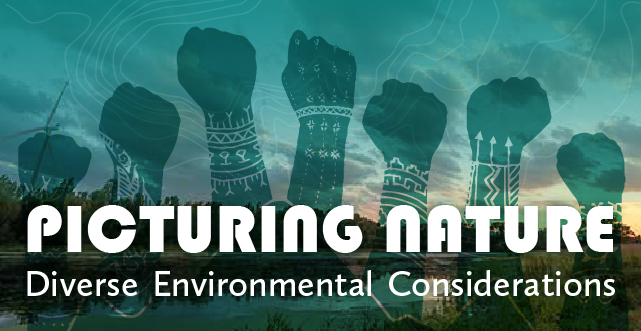 Picturing Nature: Diverse Environmental Considerations ponders an assortment of cultural responses to nature through an expansive look at art, design, and environmental activism mostly over the last two centuries. Drawing from St. Olaf College collections and beyond, this exhibition presents over 120 works and interprets them through an interdisciplinary ecocritical lens drawing upon art and environmental history. Artistic responses to well known environmental issues such as industrialization, global warming, and endangered species are presented alongside celebratory, poetic, and abstract responses to the natural world. The exhibition introduces how cultural perspectives – shaped by societal values, religious beliefs, customs and the like – have had profound environmental consequences. This exhibition is curated by Associate Professor of Art History and Environmental Studies Matthew Rohn with help from students of Art History and Environmental Studies. Special thanks to the departments of Art and Art History and Environmental Studies for their generous support. Guest lecturer Richard Bresnahan is an esteemed artist and director of the pottery studio at Saint John’s, a Benedictine abbey and university in the woodlands of central Minnesota. A respect for natural systems has long shaped the artist’s dialogue with fire and clay. Bresnahan’s pottery utilizes natural resources from his nearby surroundings – local clay and glaze made from ash – and his artistic vision is informed by global environmental concerns. His lecture will expand the exhibition’s consideration of sustainability, functionalism, community building, and a commitment to preservation of the environment. Friday, November 16, 3:30-4:30 p.m. Explore St. Olaf’s Natural Lands on a guided nature walk with student naturalists. This one-hour walk begins promptly at 3:30 p.m. outside Flaten Art Museum in the Center for Art and Dance. The excursion will lead you on a one-hour tour through a portion of the College’s 350 acres of restored natural habitat adjacent to campus. Tuesday, December 4, 2018, 12-12:30 p.m. Walk the exhibition with curator Matthew Rohn for an in-depth look at the environmental issues and cultural values represented in the artworks on display. Drop-in for a hands-on event for artists of all ages. Nicolas Lampert uses his practice to advance social justice movements. In this all-ages, hands-on workshop he’ll teach his eco-friendly mud-stenciling technique.